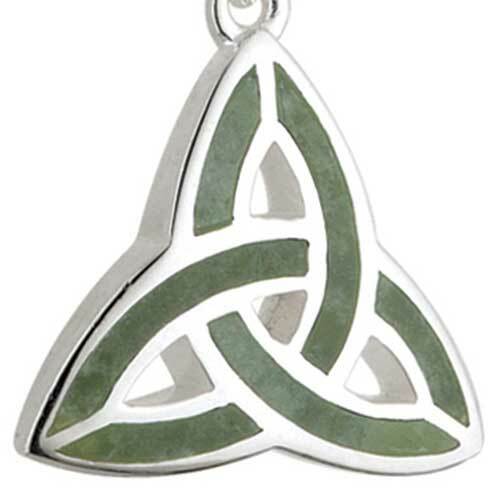 Connemara marble necklace is cast in sterling silver and features an engraved Celtic Trinity knot. 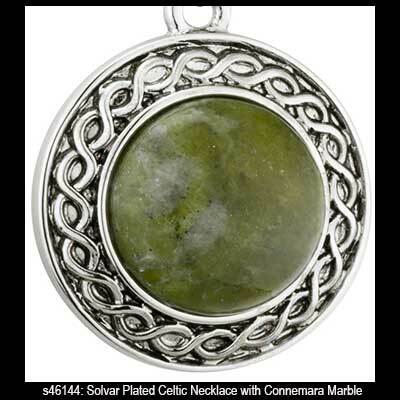 Celtic necklace is cast in sterling silver and features a center dome of Connemara marble that is surrounded by a marcasite stone studded open knot design. 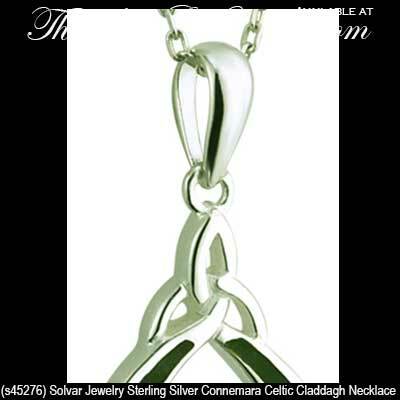 Sterling silver Celtic necklace features inlaid Connemara marble in the classic Trinity knot design. 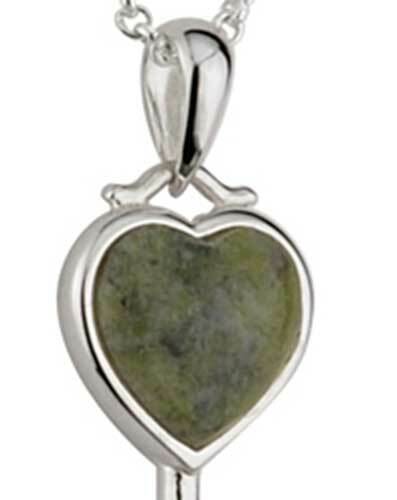 Shamrock necklace is a sterling silver key that features a heart with Connemara marble. 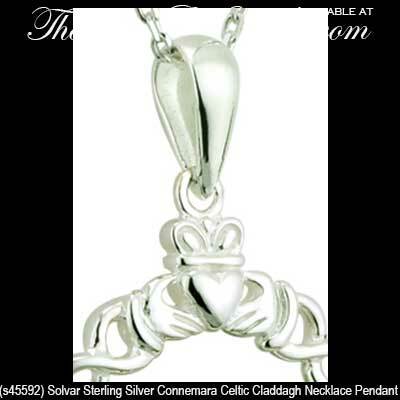 Sterling silver Claddagh necklace features a Connemara marble heart along with additional accenting. Sterling silver shamrock necklace features Connemara marble leaves along with the stem and the balance of the pendant studded with marcasite stones. 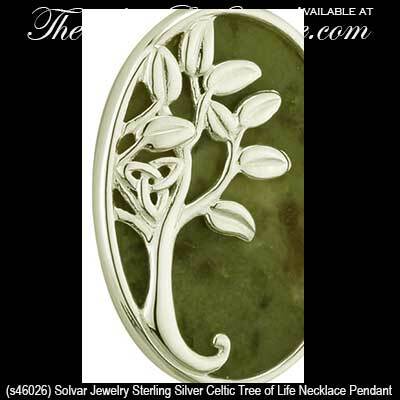 Sterling silver Connemara marble necklace features the Tree of Life that is enhanced with a Trinity knot. 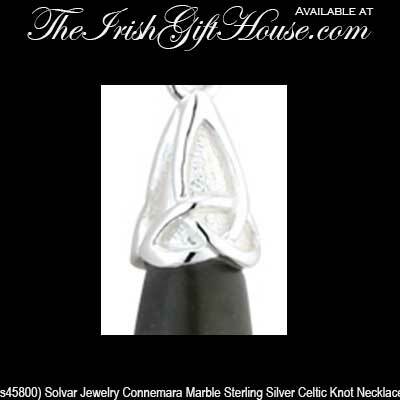 Sterling silver Celtic necklace features a facet cut dome of Connemara marble along with a knot design. 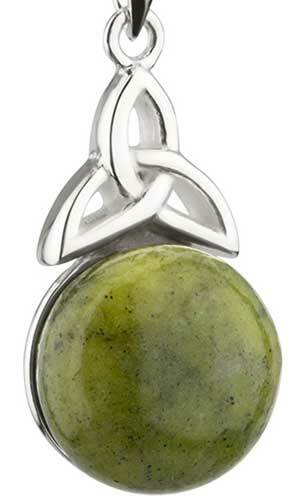 Sterling silver Celtic necklace features a Connemara marble center that is surrounded by a love knot motif. 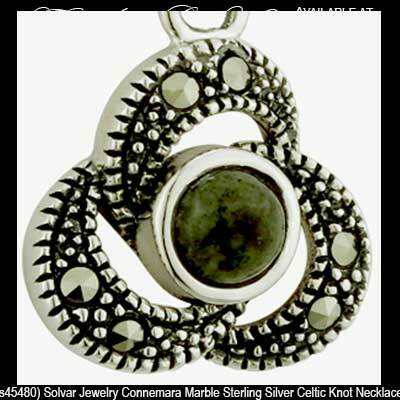 Sterling silver Celtic necklace features a center dome of Connemara marble that is surrounded by marcasite stones. Connemara marble necklace is a long design that is topped with sterling silver Trinity knots. 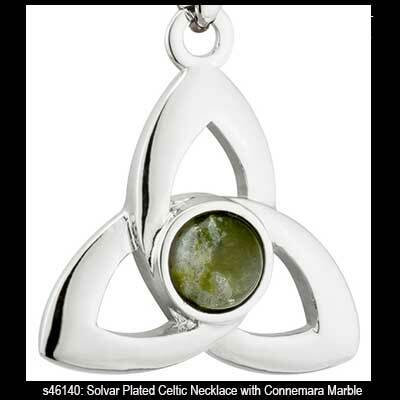 Celtic necklace features a sterling silver Trinity knot above a half round Connemara marble orb; the Connemara marble is enhanced with a sterling silver disk backing. 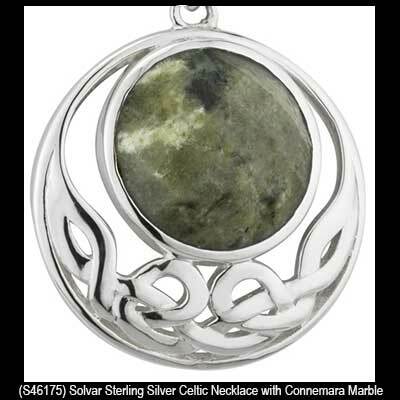 Sterling silver Celtic necklace features a dome of Connemara marble in the center along with filigree knot-work around the edge. 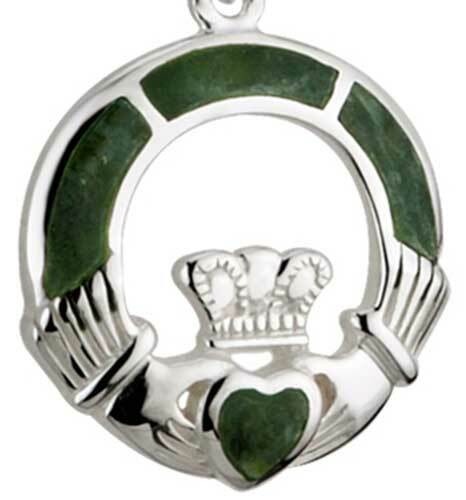 Claddagh necklace is cast in sterling silver and features a dome of Connemara marble in the heart. 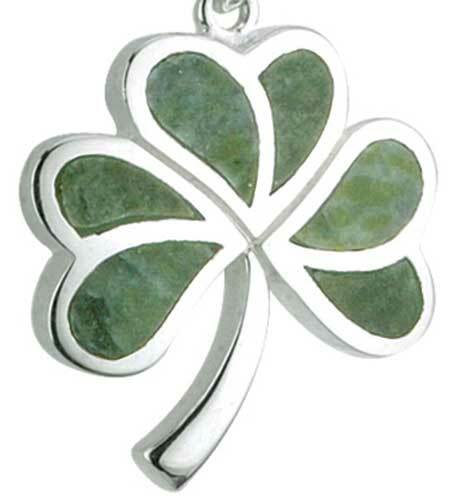 Irish necklace features inlaid Connemara marble that is set in an embossed plated pendant. 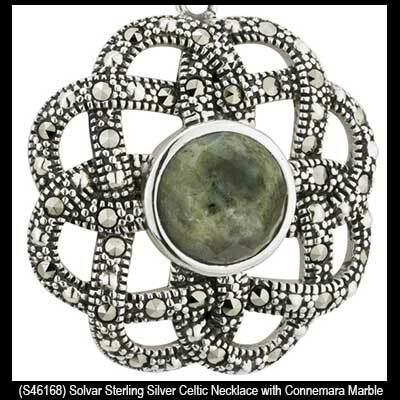 Connemara marble necklace is an oval shape design that features embossed rhodium plated accenting along the rim. Connemara marble necklace features a marquise shaped design along with a rhodium plated finish. Connemara marble pendant features silver tone plated accents. Connemara marble necklace features a rhodium plated finish. 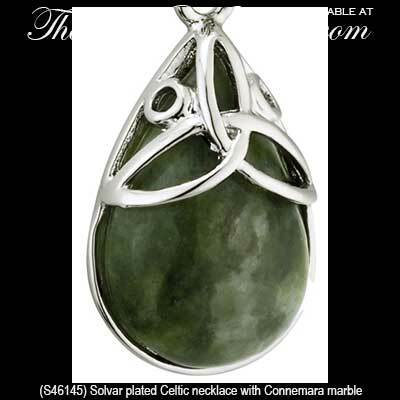 Celtic necklace is a rhodium plated design that feature a Trinity knot with a polished dome of Connemara marble in the center. Welcome to our Connemara marble necklace section; here you will find Irish symbols such as the shamrock and the Claddagh along with Celtic icons that include the Tree of Life necklaces and the Trinity knot. It is reasonable that you may wish to compliment your pendant with a pair of Connemara marble earrings and this should not be a problem as we have almost as many available choices. Another fantastic addition to your Irish jewelry ensemble would be a Connemara marble bracelet or if you prefer we also have many selections of Celtic bracelets without Ireland's gem stone. The Irish Gift House always wants to give you as many choices as possible so in wrist wear we also have a grand selection of Claddagh bracelets and if you really want to mix things up, please take a look at our black Kilkenny marble jewelry where we also have an assortment of bracelets. With so many Connemara marble Celtic cross necklaces we had to give them their own page within this section and this is why you will not find them with the balance of the Connemara marble necklaces. 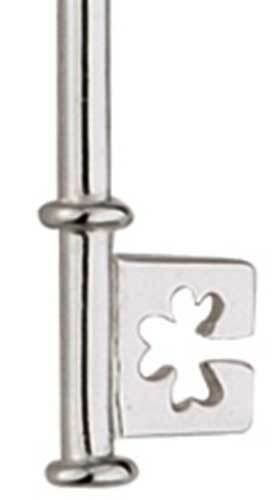 In fact we have so many Celtic crosses that we have to create their own separate index heading; here you will not only find silver Celtic cross necklaces and gold Celtic crosses but you will also find Celtic crosses for the wall and as gifts among the many choices. 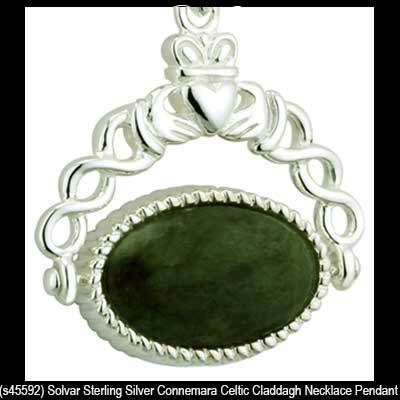 This collection of Connemara marble necklace and pendants was crafted in Ireland by Solvar Jewelry or by All That Glisters.